Home » The Rules » #1 - Eat only whole grains » More Whole Grains, Please! At Bob’s Red Mill, “unprocessed” foods are our bread and butter. We pride ourselves on keeping true to the ingredients we use. One pound of wheat berries go into a stone mill at Bob’s Red Mill and one pound of whole wheat flour comes out. No preservatives, no weird chemicals, just grains, beans, or seeds. When Andrew approached me to write a blog post for October: Unprocessed, I jumped at the opportunity to become a member of this group and take on his challenge in my own life. Our main goal at Bob’s Red Mill is to provide whole grain foods for every meal of the day — not just breakfast. Whole grains should be the base of any diet — especially one focused on eating unprocessed, whole foods. A whole grain is made up of three parts — the bran, the germ and the endosperm. Each part is an integral component to producing a healthy plant and when eaten, the parts work together to produce a healthy YOU. Whole grains can seem like a daunting addition to your diet, but they don’t have to be. There are many options for adding more whole grains into your life without sacrificing flavor or making a huge time commitment. Here are some tips for getting three servings of whole grains every day. Not only will you be getting more whole grains, but you’ll get more fiber, more vitamins and minerals, and help keep your blood sugar stable. Oatmeal. Can we say it enough? Oatmeal in the morning fuels you through the day and starts your day off right. 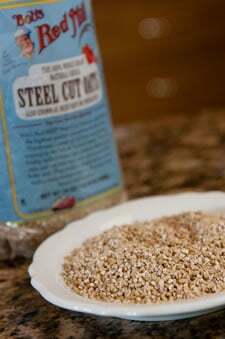 Most varieties are whole grain, but we particularly love Steel Cut Oats for their chewy texture. Did you realize that making oatmeal cookies using whole wheat flour can be a healthy, whole grain treat? Brown Rice. It’s the gold standard of whole grains; it tastes good and is incredibly versatile. 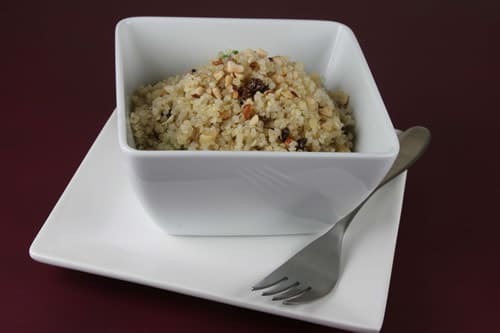 Use brown rice in place of white rice or potatoes as a side dish. Bulgur and whole wheat couscous also make great sides. Quinoa. This funny and delicious grain (pronounced KEEN-WA) takes just 15 minutes to cook and can be used in soups, sides, or eaten for breakfast. Use Whole Grain Breads. Look for bread with a whole grain listed as its first ingredient. Replace half of the flour in your baking with whole wheat flour. If you’re feeling really bold, replace all of it! Whole Wheat Pastry Flour is a great choice for baking cookies and quick breads. Recipes for using whole wheat flour can be found all over the web — including our own website. Buy whole wheat pasta or buckwheat noodles (soba) instead of white pasta — there are some wonderful varieties that add flaxseed meal, some made using quinoa flour and spelt flour. For snacks, look for whole grain crackers or simply pop some popcorn. Did you know popcorn is light, fluffy, AND whole grain? These are just a few ideas to help you get started. For more hints and tips, check out our blog at www.bobsredmill.com/blog. Cassidy Stockton writes and publishes a blog on behalf of Bob’s Red Mill Natural Foods, a distinctive stone grinding miller of whole grain natural foods. Bob’s Red Mill offers the widest selection of whole grain, natural, organic and gluten-free flours, cereals, and baking mixes. And, of course, they’re a sponsor of October Unprocessed 2015! You can follow them on Facebook, Twitter, Instagram and Pinterest. For those who think whole grains are unappetizing or time consuming to prepare, the pre-rinsed organic quinoa from Bob’s Red Mill is a great introduction to how delicious and easy it can be to incorporate whole grains into your meals. Seasoned with a bit of olive oil, salt, and pepper, it’s a great base for vegetables and/or meat or seafood. Try substituting it for rice–you can even make it in a rice cooker. I’m a fan! I’m eating red quinoa for breakfast a lot for this challenge. Toss the cooked quinoa with some diced apples and chopped pecans, a little grade b maple syrup and a pinch of kosher salt and it’s a very fine way to start the day. Other typical breakfasts for me; apple slices with fresh ground peanut butter or thick cut oatmeal with cinnamon and peanut butter plus a hint of stevia (but for this month it’s maple syrup or honey). So excited to incorporate more whole grains into my #octoberunprocessed plan! !